I never used to eat breakfast; I just could never be bothered in the morning to actually make myself something. I think many of you can relate to this. I have the solution though! You must try making overnight oats. Not only is it a healthy and full of fiber but extremely easy to make while being super versatile. This is my favorite rendition of overnight oats. You can obviously enjoy it with whatever toppings you like! I also highly recommend having chia seeds and ground flax seeds in the pantry. There are a great source of nutrients, fiber, and good fats. Adding this to your breakfast will surely help kick off the day! In a cereal bowl, add the rolled oats and Chia seeds. Cover this with the cup of almond milk. The milk should be covering a majority of the oats. Optional: can add almond butter and mix it in with the oats as well or just add in morning. Cover this with plastic wrap and let it sit overnight. Oats will soak up the milk and become soft. This doesn’t necessarily have to sit overnight. Can sit for several hours and have the same result. In the morning, give a quick mix to the oats in the bowl. 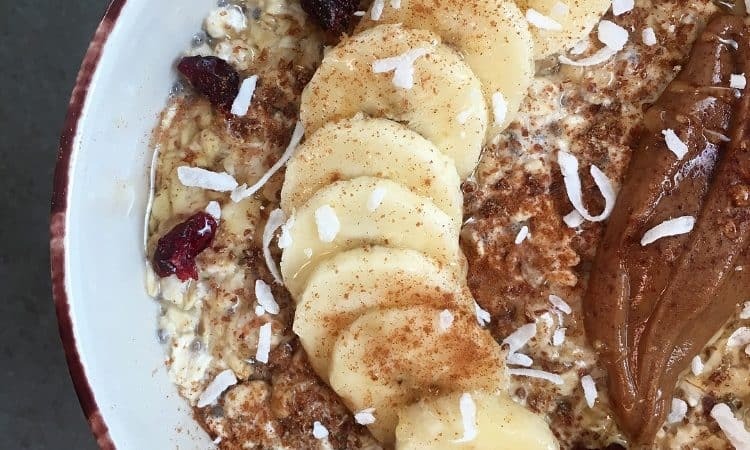 Then top the oatmeal with bananas, flax seeds, dried cranberries, cinnamon, honey and coconut flakes! 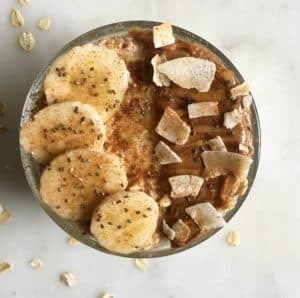 If you have pecans or walnuts; those add a great crunch texture the overnight oats and works really well with these flavors too! Also, you can technically put all these toppings into the oats the night before and it will be fine that way too! I just like to top it off the following day more; it only takes a minute or two.